Gandy Installations carries a wide range of industry leading Lennox and Carrier rooftop units, Delhi exhaust fans, and Engineered Air makeup air units. 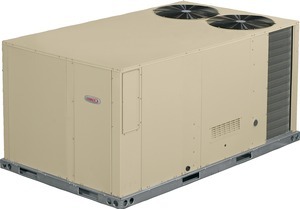 These rooftop HVAC systems provide reliable heating and cooling to commercial buildings, and ensure that indoor air quality is up to standard. Our Energy Star units and energy efficient zoning solutions help to keep energy costs down. Removal of old equipment is always included with the installation of a new rooftop unit. Our sheet metal fabrication shop is equipped with a computerized plasma cutting bed for exact precision in sheet metal cutting. We follow all the latest guidelines and standards of the Sheet Metal and Air Conditioning Contractors National Association (SMACNA) to guarantee that our work always meets or surpasses current industry standards. We provide customized commercial sheet metal manufacturing and installation at lower prices than our competitors, while maintaining high standards of craftsmanship on every project. We offer service contracts for the quarterly maintenance of commercial equipment, to accommodate the recommendation that commercial rooftop unit filters be changed 4 times per year. Our maintenance service includes: filter changes, condensate trap cleaning, and regular testing of equipment to ensure optimal performance of rooftop units. We use only high quality pleated air filters with a Minimum Efficiency Rating Value (MERV) of 8. By maintaining the minimum air filtration recommendations for commercial buildings and changing filters quarterly, we ensure smooth and efficient commercial building operations throughout the heating and cooling seasons. Quotes on repair, replacement, or maintenance of rooftop units are always free.